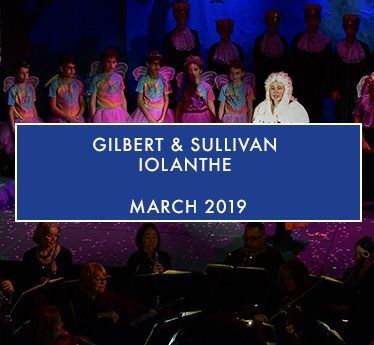 The Allen-Stevenson School | A Magical Performance of Gilbert & Sullivan’s "Iolanthe"
A small but strong cast performed Gilbert & Sullivan’s Iolanthe on March 12, 13 and 14. The operetta, also known as The Peer & the Peri (the House of Lords and a group of fairies), was created in 1882, just one year before the founding of Allen-Stevenson. Production Assistant David Kersey h’98 spent a few minutes providing background information about the show to the student audience, explaining that Allen-Stevenson has been performing Gilbert & Sullivan operettas for a very long time. “Because these operettas cover a wide range of voices – soprano, alto, and base – they are particularly suited to this age group,” he said. Emphasizing that the plot is complicated, Mr. Kersey also added that when Iolanthe was written people believed that fairies could influence a situation, as in Peter Pan. Production Manager Jaison Spain ’97 took this opportunity to let the boys know that he once played the role of one of the fairies when he was a student at the School. As the lights on the stage came up, the audience was immediately captivated by the stunning forest setting, beautiful costumes of pastel tie-dyed fairy tops with wings, the humorous introduction of Iolanthe with hopping plastic toads and the melodic sounds of Lord Mountararat’s recorder playing. Soloists sang Gilbert’s complicated lyrics with ease and the choruses of fairies and Peers added depth of sound and entertaining movement. The tech crew were at the ready to shine the spotlights at key moments, flicker the lights to signify the arrival of the fairies and ensure the microphones for each soloist were ready on cue. The orchestra, consisting of a number of the School’s instrumental instructors along with guest performers, professionally accompanied the young singers. Thank you to the many who made this production possible, in particular Directors Michelle Demko and Stacy Donovan.